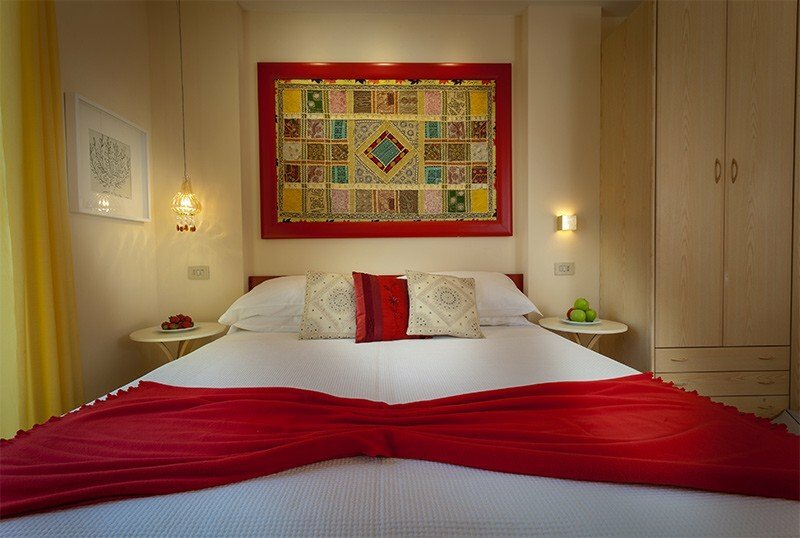 The Hotel La Fenice , 3 stars of Marebello di Rimini, is elegant, colorful and full of services. Suitable for both young people and families, the hotel has a large parking, WI-FI, playground areas for children and table football. Accept small animals. Hotel La Fenice is in Marebello, halfway between Rimini and Riccione. Located in one of the main streets of the area, Viale Mantova, the hotel is a short walk from the beach and Viale Regina Margherita, full of shops of all kinds. Surrounded by the greenery of its garden and the Park of Marebello, a few meters away. Some rooms have been completely renovated in 2016, all have a balcony (sea view on request), independent air conditioning, WI-FI, satellite TV and digital LCD 22 ", safe, direct dial telephone, automatic wake-up call, minibar, services private bathroom with shower, hairdryer and complimentary toiletries Breakfast in the room on request. Garden, terrace, free use of bicycles, reading room, elevator. On request: laundry service and beach towel all inclusive. PARKING: uncovered, available in all inclusive form. AIR CONDITIONING: available in the common areas and in the room (all inclusive). CONVENTIONS: beach, amusement parks, discos, swimming pool (Beach Village free), waterslide (La Perla free), free shuttle to the Beach Village, organized excursions (on request). SERVICES FOR DISABLED: entrance located on the ground floor, elevator under. BREAKFAST: international buffet, plentiful and made of homemade desserts, hot croissants, jams, yogurt, cereals, fruit and cold cuts. LUNCH AND DINNER: buffet with a choice of 5 meat, fish and vegetarian menus, seasonal vegetable buffet, hors d'oeuvres and crudités, homemade desserts. OTHER: theme dinners are organized every week, such as a typical local dinner or a candlelit Gala dinner. If you wish, you can have lunch on the beach. In hotel: passes on request (depending on availability), indoor and outdoor playground area, baby / mini / junior club, live entertainment. On request: pediatrician and baby sitter. In the room: cot on request, bottle warmer upon request based on availability. At meals: baby food , baby food, baby menu, high chairs, afternoon snack. On the beach: children's pool, playground area, baby / mini / junior club. Prices may vary based on occupancy, events and seasonality. TOURIST TAX: € 1.50 per person per day, excluding children up to 14 years and for a maximum of 7 days. - In case of early departure on the booked date, the cost of the room will be applied for a maximum of 3 days. - Meals not consumed in full board treatment will not be deducted from the price. - The deposit will be returned for rooms that will be canceled one month before arrival otherwise it will be considered valid for another stay. - For cancellations at the last minute (10 days before arrival), even if due to unforeseen events or illnesses, will be retained as compensation. Special discounts for families and children FREE in June! Excellent cuisine and a warm, typically Romagna welcome! - free admission to Mirabilandia for children up to 10 years. Special offers summer weeks, in All Inclusive Formula, for 7 days, prices per person. the first week of June in Formula All Inclusive € 343.00 per person for 7 nights. Offer second week of June in Rimini! Offer third week of June in Rimini!